Escape the ordinary trappings of impersonal chain hotels and discover Inn on Mill Creek, where guests are treated to a full sit-down breakfast. 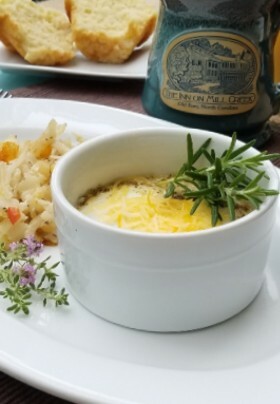 In warm weather months, you can enjoy that all-important first meal of the day in our glassed-in dining solarium, looking out on awakening Pisgah National Forest that surrounds our bed and breakfast near Black Mountain and Asheville. In cool weather, guests dine inside the Main House in our cozy dining area by the kitchen. Typically, we offer two breakfast seatings, to meet the needs and schedules of our guests. Coffee is on at 7:30 a.m. (Dave is selective about his brew), and we offer fresh-squeeze and blend juices, with fruit from our orchard when in season. Need a snack during the day (or at midnight)? You’ll find baked goodies, such as snickerdoodles, flourless peanut butter chocolate chip cookies, pumpkin bread, brownies, scones, etc., under glass. Snacks vary throughout the week. Our philosophy on breakfast is that ‘hearty trumps fancy’, though we do try to make and present breakfasts that are memorable and not just plain everyday breakfast fare. With a few rare exceptions, individualized portions of the main entrée are prepared by Dave, rounded out with muffins or breads, a side meat, fresh fruit dish, and fresh-squeezed juice blends. Individualizing our portions means we can modify a dish or serve to your specific taste (e.g., leave out or substitute for a specific ingredient), so do let us know if you have any special dietary requests or allergies when you reserve your room. We can prepare diabetic-friendly, gluten-free, and vegan dishes, as well as vegetarian alternatives for all our main dishes. And if any of our daily made-from-scratch specialties aren’t quite to your individual taste (it’s OK, you are not as picky an eater as Innkeeper Brigette, trust us), we always have standard breakfast fare available by advance request, such as cereal, oatmeal, toast, bagels, and fruit. 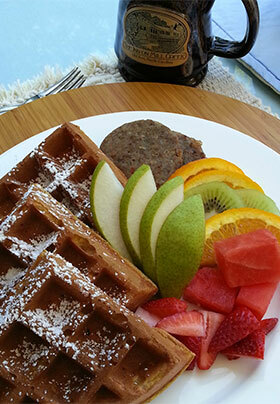 We like to share – several of our recipes are posted on our Bed & Breakfast Blog.